VIDEO TIME! Swimming With Hair Color! Keeping hair color fresh and vibrant over the summer can be a tricky business. Vacations, swim camp… there are so many elements that can fade your hair color. Check out this video for our tips and tricks on how to help your color during these trying times. p.s- hard water stains? Try dipping the item in white vinegar. VIDEO TIME! 3 Ounces of Product To Carry-On?! The travel season is upon us. We all want to look great for the family (especially if you have those in-laws, let us be honest.) But I personally don’t want to see my checked baggage rummaged through or thrown carelessly about, or worse-LOST. So I carry on my baggage whenever I possibly can. I actually had an airline employee take my carry on luggage when they ran out of room for carry-ons in the overhead compartments. I begged him no, and explained to him I had lost luggage before. He promised it would make it. It did not. I froze in Montana in December for two days until it was returned. But the 3 ounce clear Ziploc regulations make everything so hard! So we break down out 3 favorite travel size products to make your holidays a bit easier. p.s- During your many family and social gatherings, keep a level head with those that rub you the wrong way. I accomplish this with Kentucky Straight Bourbon. As you may or may not know, I am not what one would call……techno savvy. Before I started renting a chair in a salon I didn’t need a fancy pants cell phone. Mine flipped open and it’s biggest advance was it had a camera. Once I started needing to use Square as payment, it became apparent I had to join this century. So I got a smartphone, and with that phone came the ability to advance my paltry social media standing. I am already on Pintrest, YouTube, Facebook, my blog….well, I guess it’s not totally paltry. I only use social media for work purposes, as Hubs and I are extremely private. Enter stage left-Instagram. I am asthecurlturns56. I have a few followers, 150 or so, and I follow about as many. I post hair that I do, food I make, and anything that has to do with my 1950’s housewife brand/life. I have found that I really like Instagram. I love seeing other people’s pictures and what they are doing, although there are a few obsessive posters that could do with a few less uploads. I certainly don’t need to see seven selfies a day, although I do love a good selfie. I like connecting with total strangers far away over fun things, like tv programs or James Dean. The issue is getting more followers in order to help build my updo business specifically. I roll updos all the time on my severed heads and post them, careful not to make it look like my manikin head. Lots of directed hashtags, all very specific. Post post post, with such slow results. I am gaining followers, but it feels real slllooooooowwwwwww. Perseverence and patience? Yep. Grandma says good things come to those who wait, but As The Curl Turns knows waiting can be challenging sometimes. Updos come in all shapes and sizes, be still my beating heart. But they do not all require pins. This particular updo requires only a needle and thread. It is quite speedy, which is nice when time is of the essence during a wedding or group event. We have all had head counts or time frames change on a dime! First, set the hair as usual. 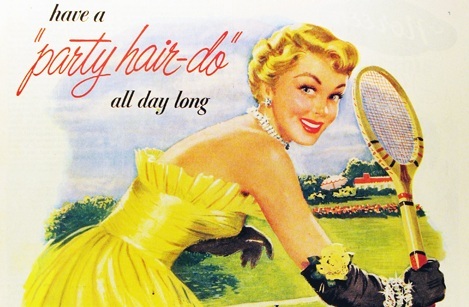 Take the set out and loosen/brush the big loose curls with the tail of a rattail comb. Spritz with hairspray and don’t be shy. The curls need to be firm. You may need about 6 feet of doubled over thread, so three feet of useable thread. I used regular thread here, but embroidery thread works well too. 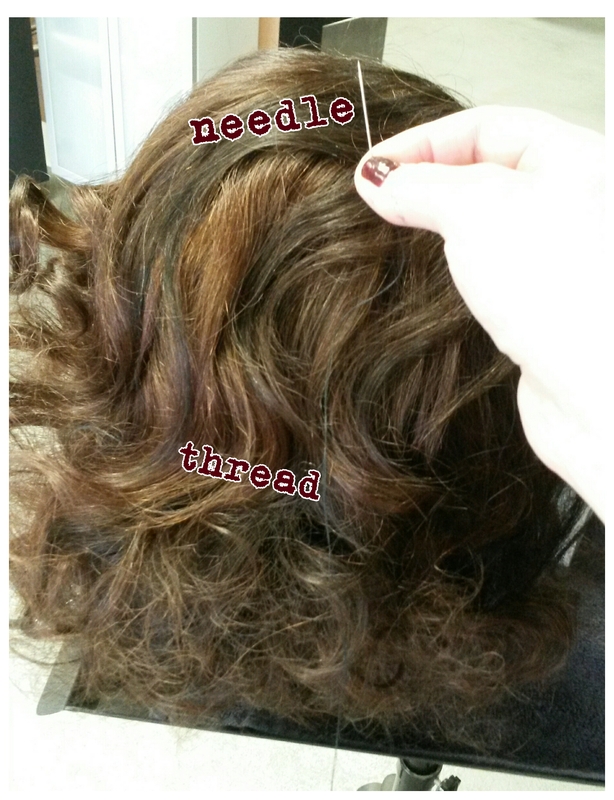 A curved extensions needle works as well as a straight one. 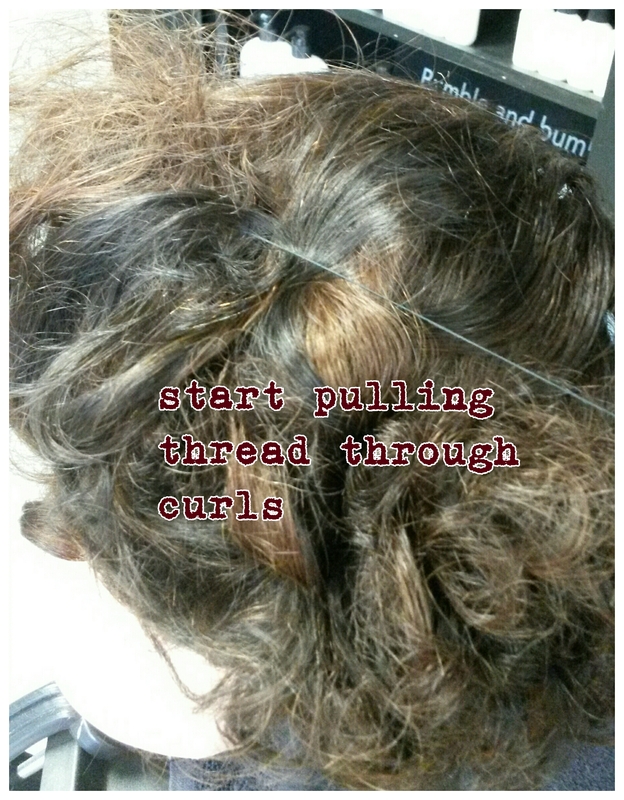 Tie a knot around a curl starting on one side of the head and start sewing, in and out and around the curls. Up, down, in and around with the thread. 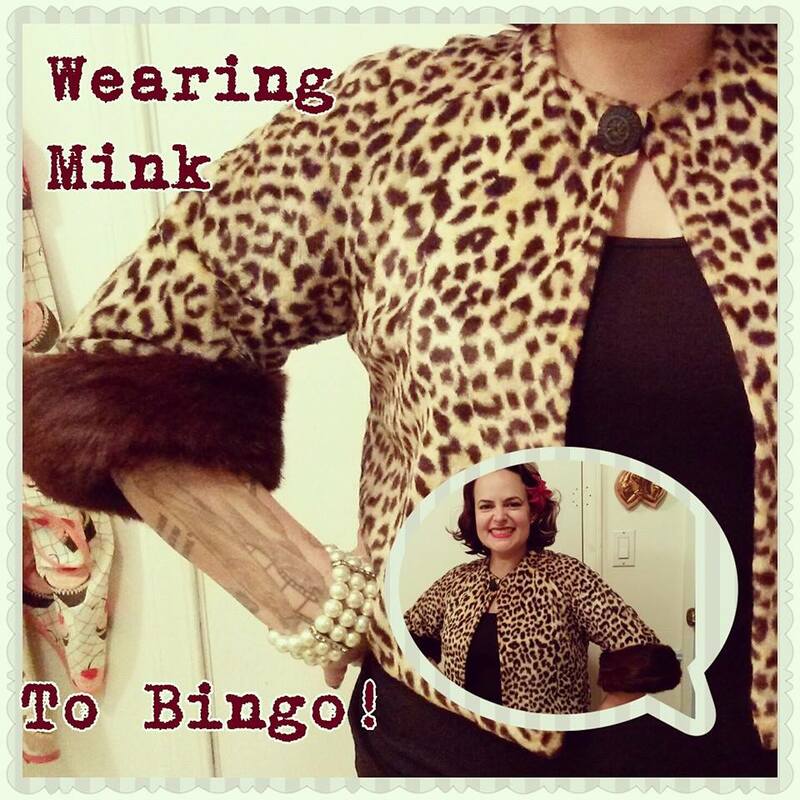 Gather the hair as you like it and sew! 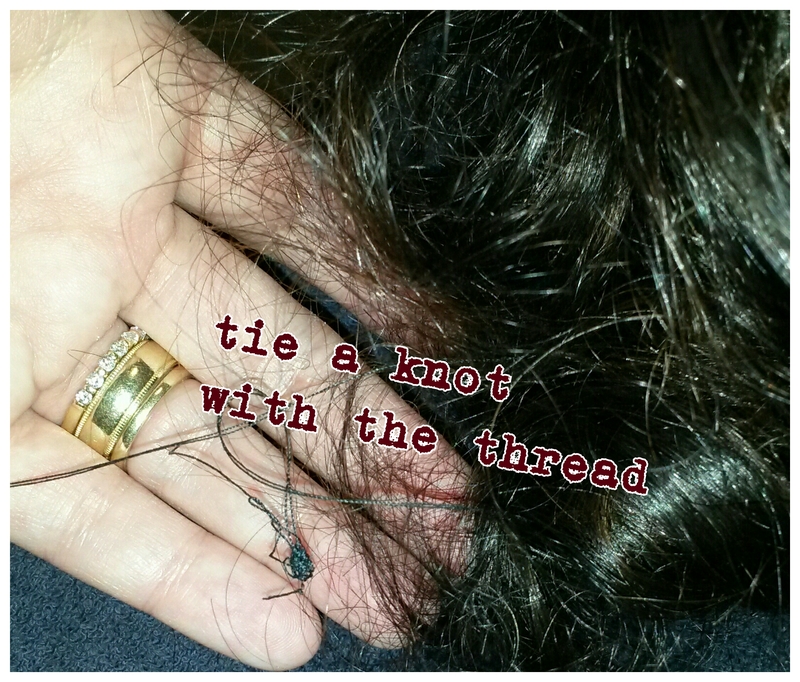 Once you are all the way through to the other side, tie off the thread, and viola! 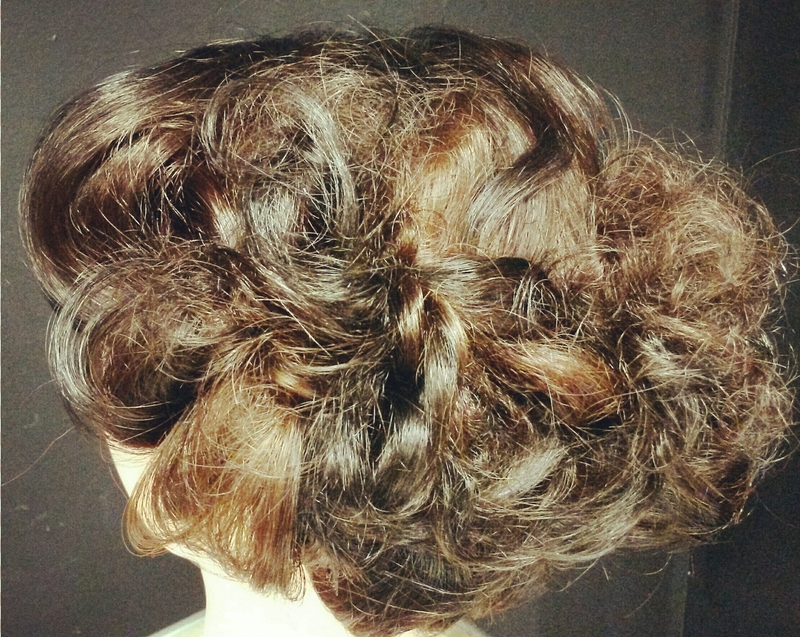 A nice, loose looking but totally secure romantic updo that will last. Shellac and you are done! And without a single pin. Grandma may say there is more than one way to bake a cake, and As The Curl Turns agrees. p.s- martinis becoming too warm too fast? Try a smaller martini glass. Those big glasses may look cool, but they lose their cool quickly. VIDEO TIME! Victory Rolls Tutorial! Let Victory Rolls be a mystery no more! VIDEO TIME! Rosie The Riveter Bandana-Tie it! Tying a Rosie bandana can be tricky, and keeping it on can be even trickier. Tune in to see how to keep one on all day.